Sometimes lessons come from the most unexpected places. 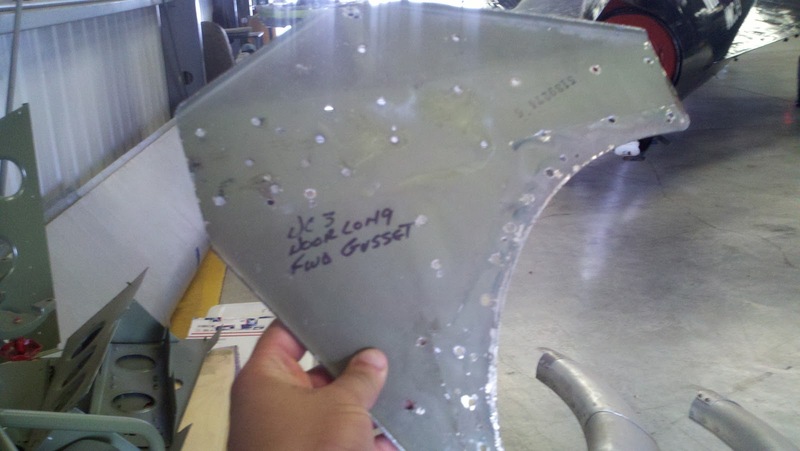 One of those lessons was an invaluable schooling on how sheet metal parts are made. Not out of a book, or in a video. But from an experienced hand who's been doing it for decades. A couple of weeks ago, while working my volunteer gig at Planes of Fame in Chino, Ca. 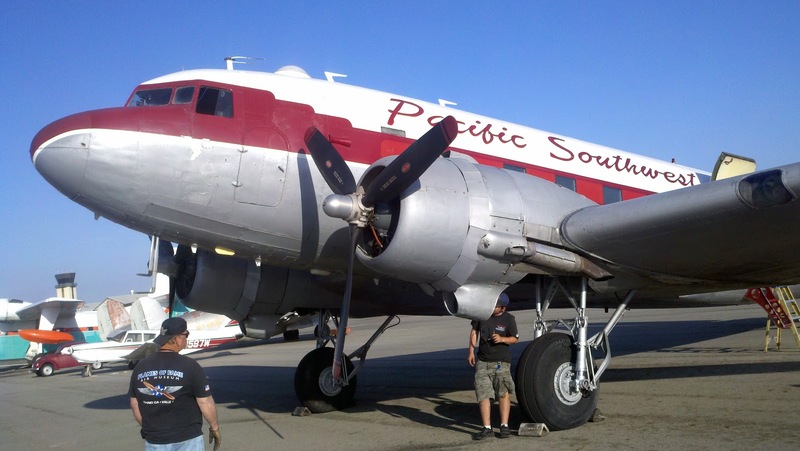 I found myself talking to the DC-3 restoration crew. The DC-3 at Planes of Fame is on the road to flying again, but needs to have some work done to it. Tony, an Airframe and Powerplant mechanic started out working on aircraft in the U.S.Navy. He's been at it so long, some of the ships he's served on are museums now. 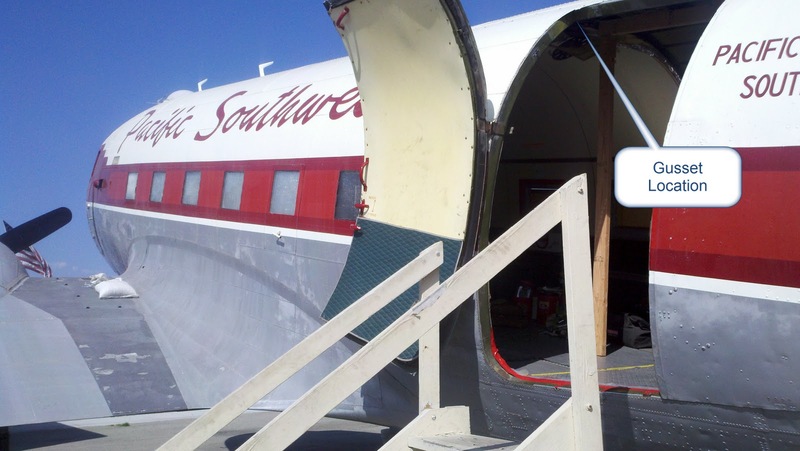 He's studying a door gusset that's come out of the DC-3's door. "This part is finished." He remarks confidently. "See here?" He indicates the ends of the part. "It's been drilled too many times." I can see three holes in the part where one should be. There's a few extra holes that shouldn't be there! There's an extra one here too! But Tony's lesson is just getting started. "We're going to have to fabricate one." His eyes narrow as he studies the part. "The part is made out of 2024-T6, but the bend radii on the flanges are too tight. If we try to use T6 from the start, the part will crack. 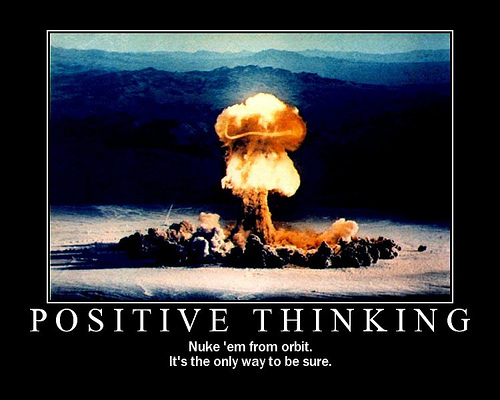 That wouldn't be good." He smirks. "So what's the plan?" One of the curious volunteers among us ask. Tony closes one eye and holds the part up, studying it. "2024-0 will bend to that radius, but we can't use in an aircraft structure. It'll have to be heat treated to T6 after the fact. We'll also have to be careful about how we cut our blank. 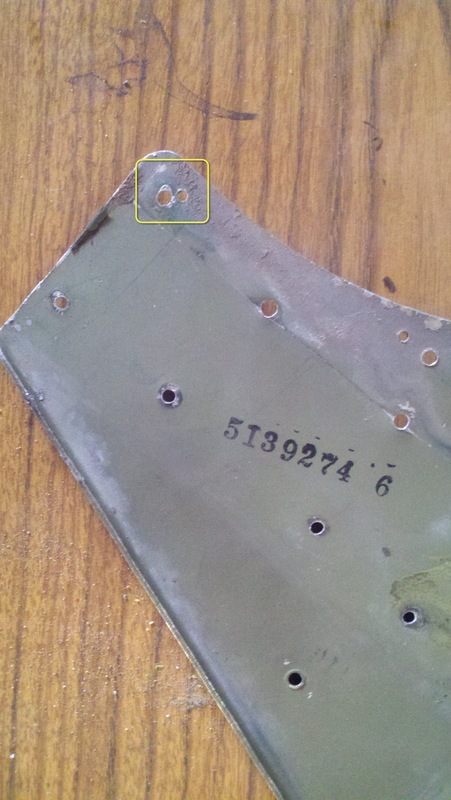 We want to make sure our flanges are oriented correctly with the metal grain." "Sheet metal has grain?" One of us asks. (I smile inwardly. This is an answer I knew!). "Sure does." Tony remarks. "Almost like wood. If you bend along the grain, the bend has a better chance of cracking." The collected few of us nod. It's been quite a lesson he's taught us. The wisdom of decades of experience, passed on with a casual confidence. "Yup." Tony smiles. "In the English Wheel for the contours, bend the flanges, we'll leave a little extra on the flanges and trim them back." He makes a casual wave of his hand. "A thing of beauty." Why relate this story? Because in our age of computer aided calculated nonlinear numerically simulated design, it's amazing to see somebody who is a true artisan of his trade. I consider myself to have learned a valuable lesson. A lesson I'm going to take back to my computer aided numerically simulated world. I'm bringing back a lesson on how parts are made in the "real world". And just as importantly, I've relearned a valuable lesson that to be a good designer, you have to understand how those parts are made. So what are my "treasured" lessons? 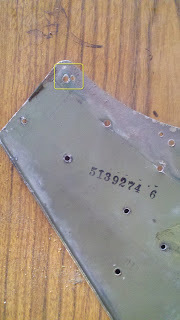 Sure I knew sheet metal had grain, and I knew it could affect a part. But when I was designing sheet metal, we never considered it. 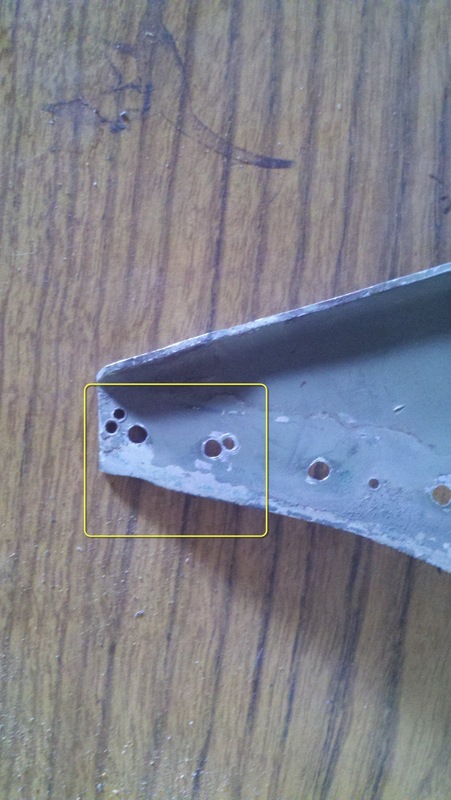 Now, I know more than being able to repeat "sheet metal has grain", like a trained parrot. 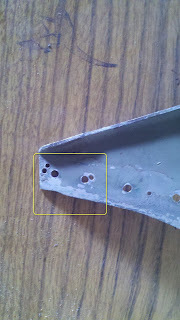 I understand how that grain can affect a part. Heat treating was another process I "sort of" understood. I knew that T6 materials won't make tight bends without cracking. But because my sheet metal design work was done in mild steel. I never applied that understanding. If we had a tight bend, we just avoided the material that wouldn't make that bend. I never even considered having to use annealed material, then treating it after the fact. Now that an experienced hand has explained it to me, I feel silly not having considered this myself. I'll truly appreciate the lessons I've learned. I hope there's a few more in my future! This week I've been spending a lot of time working on one of two things. The Autodesk Manufacturing Academy, and Autodesk Inventor Publisher. During that time, I've learned a few tricks that can made the job go along smoothly. One of the challenges I encountered was working with the storyboard. As I was moving from step to step, creating assembly (or disassembly) steps, I encountered an issue where I wanted to move a component. That part was easy. The hard part was that in order to select the component I wanted, I needed to zoom into to the assembly. But the snapshot remembers that I did that, and creates a rotation I don't want. So how do I get back to my original view? I could try to "eyeball" it, and try to match it up, but that would be tedious, and I would probably never be exactly right. Fortunately, a tool called "Extract Camera" helps with that. By using this tool, we can extract a camera view from one snapshot, and place it on the current camera. Right click on a snapshot and choose "Extract Camera"
It's great when you need to rotate your view to see something, then match it up to another snapshot. It wouldn't be a blog post without a video, so hears the video to go with the post! Life Lesson: The Temp Directory is not Infinite! Yeah, it felt a little like that! Sometimes it pays to check the obvious! 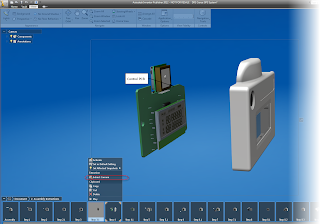 Occasional "spring cleaning" of your CAD machine is always a good idea too! 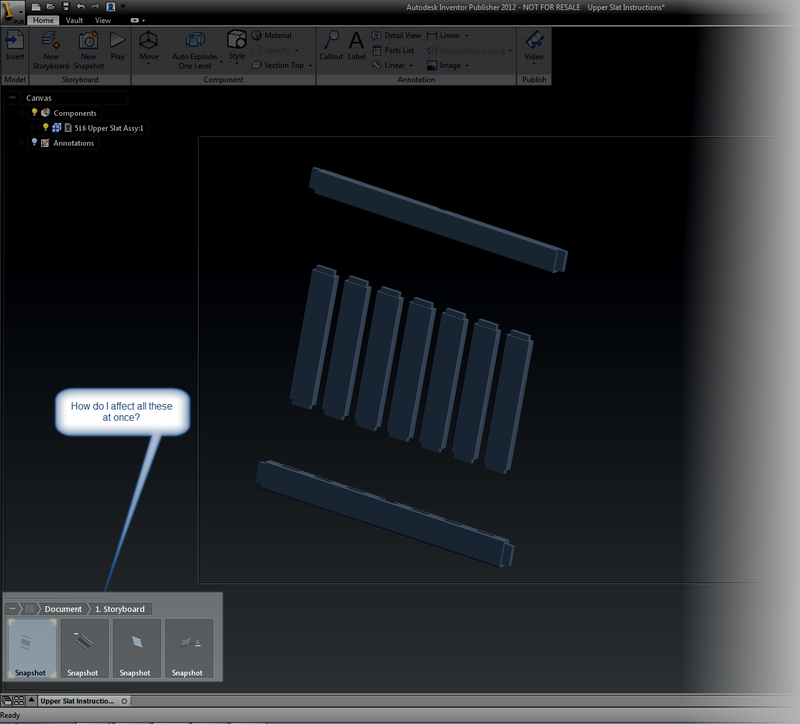 Just today I was working with Autodesk Showcase, prepping some models for KETIV's Autodesk Manufacturing Academy. I notice Showcase has started to slow down. I'm not over-tasking it, I've run larger models at higher resolutions. But it's still seeming sluggish. I perform the "three finger salute" (Ctrl + Alt + Delete) and check the task manager. My machine is running fine. I'm getting ready to try a new video driver, although I wasn't having problems a few weeks ago.... Why so slow now? Then I think, "I wonder what my Temp directory looks like?" I open up Windows Explorer and type "%temp%" to take a peek under the hood. My Temp directory looks like the aftermath of a frat party that was simultaneously hit by an hurricane. In other words, it's a mess! I use "Ctrl +A" to select all the files. I hit delete. I don't even bother checking the size of the directory. It's time to get serious. And with this Temp directory, I wanted to be SURE! Windows counts the files as it prepares to delete them. The total size of the collected files climbs like an altimeter on a space bound rocket. Finally, the numbers settle at nearly 5GB worth of files! 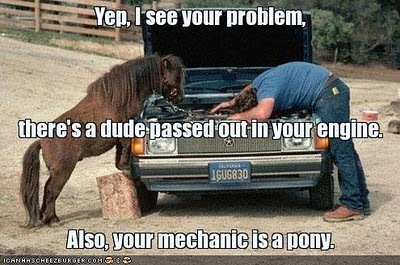 Suddenly, I can hear Adam Savage of Mythbusters fame proclaming; "There's your problem!" After a few minutes, the Temp directory is as clean as I can get it. There are always some files in use, so you can never get every last one. I open up Showcase, and try the same model. It was night and day! Showcase maneuvered around as smoothly as my memories recalled. What's the lesson! Check that temp space! It clutters up over time, and keeping it clean can really help your performance! Don't let it get to 5GB like I did! I'm afraid this is one of those weeks that I have to push my blog back a bit. It was a pretty intense weekend building some Autodesk Inventor Publisher videos, so a quality post was a pipe dream. The good news is I did get some ideas for my next tip! Look for it soon. I'm hoping to have something by mid week! 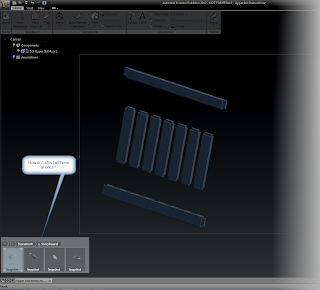 This week I found myself working with Autodesk Inventor Publisher again. As I worked with it, I realized that each storyboard snapshot had it's own camera view set. So as you moved through to each snapshot, the camera was constantly zooming in and out. In some cases, I liked it. In others, it was unnecessary, unless part of my goal was to give my views motion sickness. 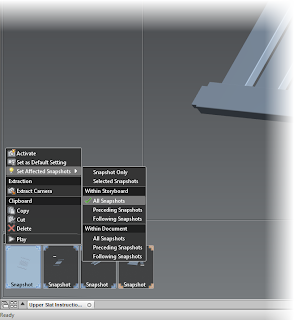 I also wanted to change the material on some of my snapshots, but the materials are also set per snapshot. Hmm. 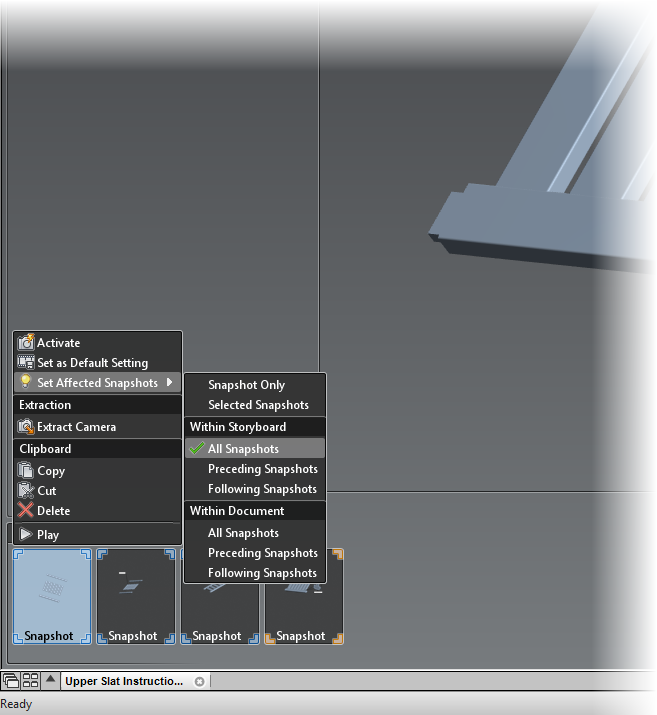 I didn't want to have to click through each snapshot and set the material. How to I affect all my slides at once? With a little bit of searching, I found the solution. If you right click on your story board, you can choose the snapshots affected by your action. Give them a try! I think you'll find they help a lot! And of course, here's a video to go along with what I've described! While enjoying the day off for Labor Day here in the United States, I got to thinking about some of the settings I change right away on a new installation in Autodesk Inventor. One of those settings is the "Repeat Command" option in Work Features. 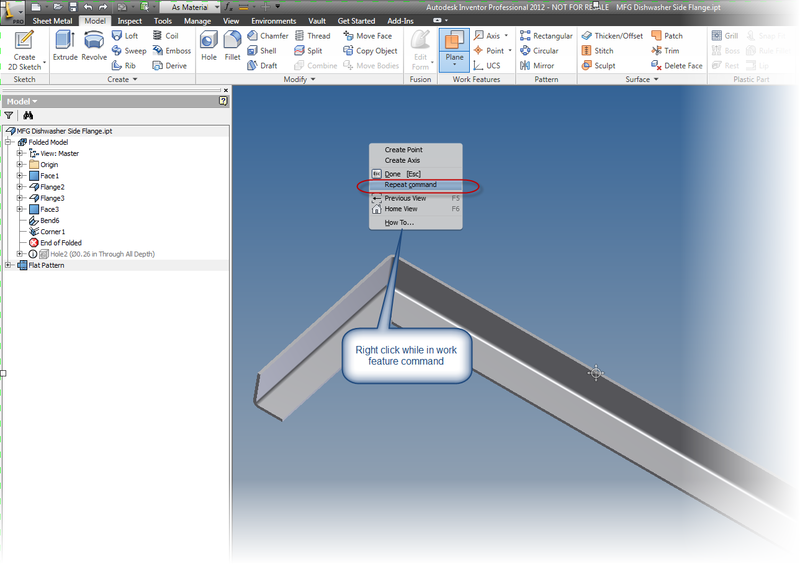 The default behavior for Inventor when your placing a work plane, work axis, or work point is to place the work feature, then exit the command. While many users like that functionality, I like to stay in the command until I exit with the escape key, or by right clicking and hitting "Done". Fortunately, Inventor allows for this. While in the Work Feature command, right click and check "Repeat Command". From that point forward, the command won't exit until you tell it to. It's a nice little feature, and one not everyone knows about! Check out the quick video! And for all you social media fanatics out there, check out KETIV's Autodesk Manufacturing Academy website on Facebook. Become a fan!